There’s only three shopping days left before the fat man squeezes himself down the chimney. If you’ve left your shopping until now, here’s a few ideas for that ‘hard to buy for’ female road cyclist, most of which you should be able to track down in time. You can never have too many pairs of cycling gloves. Even if you wash them regularly, gloves eventually wear out and need to be replaced. 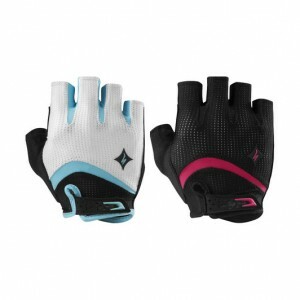 The Specialized Gel women’s gloves are sold in Specialized dealers all round the world so you should be able to pick a pair up at around $45. They come in black/white, black/white/teal and black/pink. Road ID produces identity bracelets that are a great addition to your cycling gear. I wear one which has my emergency contact details and medical information, and although I hope I never really need it, I have peace of mind knowing it can speak in a situation when I can’t. They offer electronic gift vouchers of any amount. This a shameless plug for the Women Who Cycle custom kit which will get to you just in time for Christmas if you contact me right away. Short sleeve jerseys are $115 which represents good value. Bib knicks, knicks, gilets and T-shirts are also available. Garmin bike computers are hugely popular amongst road cyclists so the female roadie in your life would love to receive the latest Garmin model called the Edge 520. It comes in a bundle with heart rate monitor and speed/cadence sensor, or as a head unit alone. Most bike shops sell them and the retail price starts at $449. If your favourite female roadie has never been to the Tour Down Under in Adelaide in January then you should buy her an airfare to get her there. There are still flights available from $109 each way with Jetstar (although luggage is extra). It’s a must-see event for all road cyclists. Contact her local bike shop and organise a voucher. Even if you don’t live nearby you can organise a voucher over the phone, pay by credit card and have it posted to you. It’s a great way to support local retail and will be warmly welcomed by any female roadie.